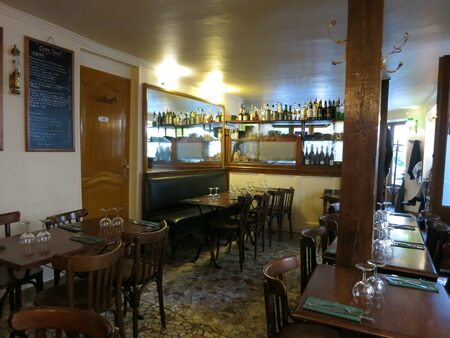 A small Parisian bistro --- the kind we like to discover --- by the Bois de Vincennes open every day. : Chef/owner Arnaud Bertrand worked in the kitchens of others --- including some high-ranked chefs --- before opening his own restaurant. He wanted to create a simple and good bistro. After dining at Chez Marcel, we can say that he has succeeded. He proudly tells you that everything is home made from fresh and, when it applies, organic ingredients. The menu is presented the old-fashioned way, written in white chalk on a black board. It fits the old-fashioned bistro décor --- always comforting to see --- with the broken tile mosaic on the floor, bistro chairs and tables, and some copper elements. Start with the nems (crispy spring rolls) that are filled with foie gras to be dipped in mango chutney. The nems do not have any taste of oil and the foie gras, though the preparation has to be fried, comes out perfectly cooked. If you like goat cheese, we recommend ordering the small tartines on which the cheese is melted with tomatoes and basil. Continue with the tartare of hand-cut Charolais meat, or the Black Angus burger. If meat is not your game, you can order the Saint-Jacques à la Provençale accompanied by roasted vegetables. Vegetarians will be happy with the ravioli stuffed with asparagus and served with a grapefruit sauce, a nice twist by the chef. The lemon pie where the base is a thick crumble is a must-have sweet finish that Bertrand should not remove from his menu. The wines from the small list, which includes organic wines, are reasonably priced and can be ordered by the glass, carafe or bottle.